'Pat Austin' Rose, introduced in 1995 by David Austin, is named for his wife, an accomplishment sculptress. 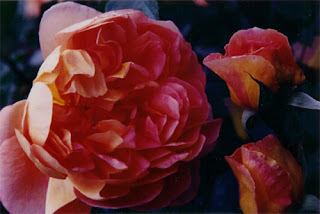 It is a color breakthrough among the English Roses that David Austin hybridized. Inside the petals is bright copper contrasting with pale yellow-copper on the outside. You get a bicolor effect like the Austrian Copper that catches your eyes as the bloom matures. Blooms are large, double and cupped and have a delightful fruity fragrance. Blooms continue through summer into the autumn. 'Pat Austin' Rose has a strong growth and arching canes like Abraham Darby with deep green and semi-glossy foliage. 'Pat Austin' Rose can be trained to be a climber if placed against a wall or a trellis. If anyone wants an unusual color in their garden, 'Pat Austin' Rose is the perfect choice.